Get rich, trip your friends. Trick-taking thief-and-dragon pursuit! SKULK is a tactical multiplayer board game for 2-5 players, where each of you is playing a thief, in the lair of a dragon. Except you’re also all controlling the dragon, too! 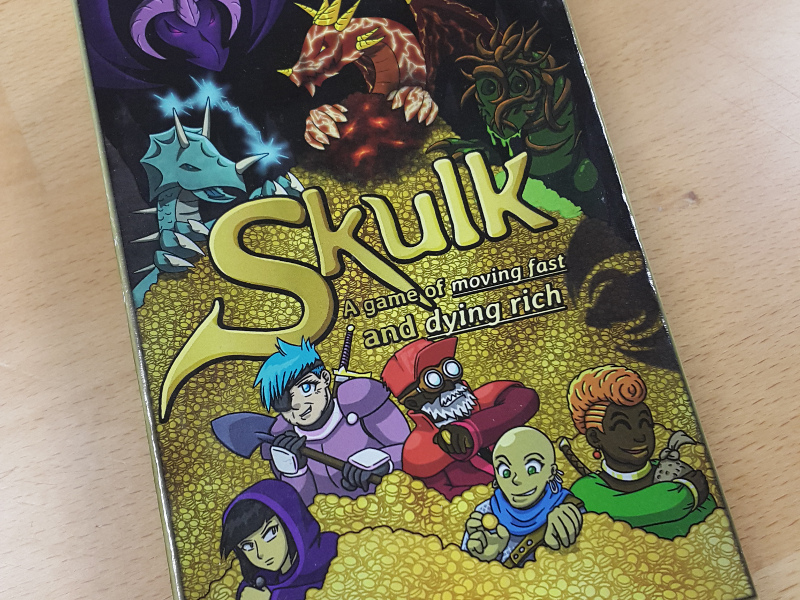 SKULK is a game of knowing when to push your luck, when to be cautious, and sometimes, it’s about grabbing an armful of gold and getting out fast. Each turn you’ll play a card, showing how greedy you’re going to be – are you going to take longer, do more, and try to take advantage of that? Or are you going to try and get in first and be content with a little? Because the greediest players don’t get to control the dragon – and that can get you pinned in a corner! Be a thief! Steal things from the dragon! Be a dragon! Eat those other thieves! Because it’s a board game with token components, you won’t normally be able to buy it from us directly. Instead, you can buy SKULK at The Game Crafter as a professionally-produced print on demand game!